Robert Angus Smith lived from 15 February 1817 to 12 May 1884. He was a chemist and an early environmentalist who invented the term "acid rain". The wider picture in Scotland at the time is set out in our Historical Timeline. Robert Angus Smith was born in the Pollokshaws area on the south side of Glasgow. 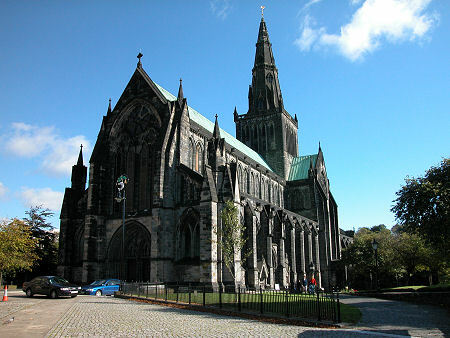 He studied divinity at the University of Glasgow, intending to become a minister in the Church of Scotland. He left before he graduated, however, and instead became a personal tutor. When the family whose children he was tutoring moved to Giessen in western Germany, he moved with them. He subsequently studied chemistry under Professor Justus von Liebig at the University of Giessen, gaining his PhD in 1841. Back in Britain, Smith briefly considered pursuing a career in the church. Instead he took up a post as a research assistant in the chemistry laboratories of 1st Baron Playfair at the Royal Manchester Institution. In 1845 he established himself as an independent analytical chemist. Working in London in 1852 he first coined the phrase "acid rain" when he made the connection between the industrial pollution so rampant in the city at the time, and the acidity of the city's rainfall. He went on to publish, in 1872, his analysis of the acidity of rainwater throughout the UK,Air and Rain: the Beginnings of a Chemical Climatology. This revealed that the most acidic rain he had found was in Glasgow. He also described three different types of acid rain found in countryside, suburbs and towns. After the Government passed the Alkali Act in 1863 to curb the acid emissions of certain heavy industries, Robert Angus Smith was appointed the first Chief Inspector of the Alkali Inspectorate. He remained in the post until his death in 1884 in Salford.